What did you say? Ashram!? Wait a minute, what's this all about? Wait, are you silent all day? Or such a place that everyone is walking around naked all the time? You are not a cult... Right?! Wait... So what is it really about? Wake up to the sound of a gong for morning meditation. Play hooky. Get up and see the desert. Cross the lawn, make a cup of coffee in the mess hall. Say good morning. There are two people I've never met before. They still don't know if they're going to head on to the beaches of Sinai or stay here a few months. Smoke a cigarette in the Smoking Temple. Jump in the pool. What are we doing today? There are a few projects. Such as? The food truck has arrived, we have to put the vegetables in the refrigerators, renovatethe plaster in room 6 or mow the lawn. Here comes Musa. What's up, honey pie? Shall we have coffee together? Sure. Who's preparing the Group Room? There's a workshop starting today. Three girls are fixing a meal in the kitchen. Can we have a little snack? No. Please? Oh, alright. Can we change this music? No. Turn it down, then? No. So I go outside the fence, and in a second it's all gone. The green oasis is left behind, and the surface is endless. I Walk on the moon, facing the red mountains, stones pattering under my feet. Far away someone is shouting in the loudspeakers. What's he saying? Dance break. In the middle of the afternoon. In the big Buddha Hall. OK, that's enough. We have to change the sheets in the rooms. Hello, wake up, the workshop people will be here in two hours. The desert takes its time. And it gives freedom. There's yoga tonight. But I feel like Kundalini. Tough break. A biscuit with chocolate spread. Another cigarette in the Smoking Temple. People come and chat. Is this how you live here? Exactly. How many people? About ten. For how long? As long as we feel like. Sounds like fun. It is. An Ashram is a place for learning and experiencing yourself. It is a school in which you decide the rate of your learning. Osho once said: "to teach meditation you need do nothing but provide a meditative atmosphere". Indeed, with the open desert surrounding us, the daily meditations and the many possibilities to work with us in the gardens and in the kitchen, to rest and to have fun – Desert Ashram is a special place that helps you shed your layers of armor and come closer to yourself and to others. And to breath. The Ashram was founded several years ago by Rafeek, man of the media, and Musa, man of Kibbutz Samar, one of the pioneers of date farming in the Arava and introducers of the Rainbow tribe, a man of vision. Throughout the years, many dear friends have lived in the Ashram or came through it, and they built and shaped its unique character. Today, the residents and operators of Desert Ashram are: Musa, Yaron, Achiad, Sofie, Ayala, Vova, Dafna, Alex, Shamo, Nirbaya, Sato, Imano, Kuzi, Shtut, Tzvijen, Dani, Lear, Michael, Manju, Brahmi, Robert, Olga, Rachel, Neta, Navin, Or, Sahar, Dor, Tamar, Yan, Eyal & Shir-Shira, Ami, Gitz, Shira-Schnitzel, Artium, Remi, Mustafa, the cats, peacocks, rabbits, Fluffy and the chickens, MD & Pedro. With us are the participants of the Working Meditation Program and other lovely people, who help around in the special everyday life of the place. As a community and a commune, we try to live together in awareness, harmony and love, honest humanity, cooperation and mutual support in the growth of this place and in the personal growth of each and every one of us. The facilities include air conditioned rooms with attached bathrooms, a workshop and meditation hall, a meditation tent with a view of the desert, a huge circular dome facing the desert, a mess hall that serves tasty home cooked vegetarian meals, camping areas with hot showers and a couple of cute little pools. Furthermore, we try to be environmentally friendly, separating the trash and making compost, natural mud construction and more. Meditations, Rebirthing, therapy, yoga, laughter yoga, Psychodrama, Contact, Tantra, Primal Feelings, breathing, bioenergy, dancing, singing, writing, art, Vipassana, martial arts, Tai Chi, Qigong, Chakra work and many more. • Come as a guest to a workshop or a festival, or just like that for no reason, for a quiet rest in a room or camping out. 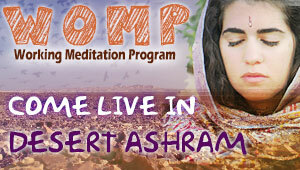 • Come to the WOMP (Working Meditation Program), and live with us for 10 days up to 10 weeks. • Come to festivals as a helper and get free entry and meals for 6 daily hours of work. Desert Ashram is on route 40, about 70 km south of Mitzpe Ramon (45 minute drive through beautiful scenery crossing Macktesh Ramon), or 85 km north of Eilat (turn left on Route 90 (Arava Route) in Ketura junction). To see a map, click here. By bus: no. 392 between Be'er Sheva and Eilat, click here to check schedules in the Egged Bus operator website. Not to bring dogs, no weapons, no drugs in the Ashram! No meat eating in the Ashram, and... yes, we do consider tuna fish as meat... And yes, remember to breathe with an open heart at every moment.